Record your VHS tapes directly onto SD card—no computer required! ! If you’re like most people, you still have a mountain of old VHS tapes that you just can’t seem to bring yourself to get rid of. You may not even have that old VCR hooked up anymore, but you’ve somehow convinced yourself that one day you’ll convert those old video tapes to digital. If only there was an easy way. 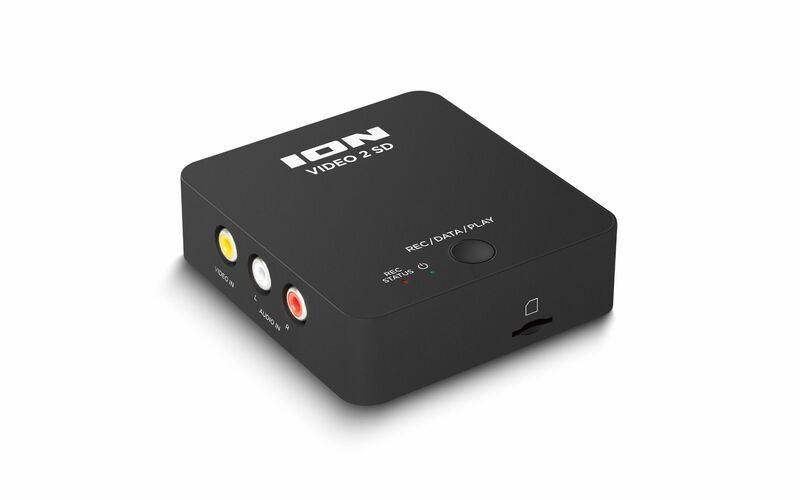 ION’s Video 2 SD is the simple way to convert those old tapes into digital. Simply connect the Video 2 SD to your VCR, pop in a tape, hit ‘play,’ and you’re done! Video 2 SD works perfectly with virtually any video source—VHS, VHS-C, Beta, even DVDs, DVR and Hi8. Video 2 SD has a USB 2.0 interface and you can easily transfer your newly-recorded video files to your computer through your computer’s USB port. Plus, since the files are recorded to SD card, they’re easily portable. You’re not tied down to your desktop. Now that priceless tape of cousin Tim knocking over the cake at Uncle Murray’s and Aunt Silvia’s 50th wedding anniversary will be preserved in digital perfection for all eternity. What a relief! No Computer required—just connect your VHS player and go!